And, on to the next! During this week's episode of The Bellas Podcast, the twins looked back on what's been a pretty transformative year for both of them, professionally and personally. First, Nikki Bella talked retirement—or, more specifically, people's surprisingly frenzied response to news of hers. "I will admit, I was not expecting as much noise that came from that on the retirement," said the pro wrestler, referring to the big career announcement that caught fans' attention during Total Bellas' recent season finale. After calling the whole experience "weird," Nikki went on to say the wider conversation surrounding her employment status with the WWE felt a little disheartening. "I almost felt like as if I was 70 years old…and I need to go retire somewhere, like move to southern Florida or something," she said Wednesday. "I was like, 'Wait, let's use this retirement word different.'" Nikki also explained that her breakup from fellow WWE superstar John Cena last year made returning to the ring with Brie Bella for Evolution even more difficult than Total Bellas audiences might have already realized. "I was just so sad because the person that was the love of my life, that was just our home, that's where we started," she remembered. Of course, those who watched the Bella Twins soar through their joint wrestling comeback on Total Bellas know Nikki didn't let those memories get the better of her in the end. And even though she and Brie have bid their respective wrestling gear adieu—at least for right now—both women agreed the WWE door probably isn't closed for good, if they don't want it to be. That said, it's definitely closed at the moment. "Yes, everyone. I am retired. Right now, I feel like I need to prioritize my life," said Brie, reiterating that her commitments to daughter Birdie Joe Danielson and companies Belle Radici and Birdiebee take precedence over chaotic wrestling schedules these days. "As well as this podcast because I love connecting with you guys," she added. 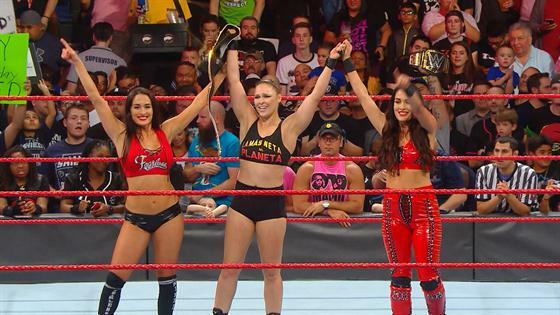 Nikki seemed to share Brie's feelings on those fronts, but also admitted a call from WWE's Stephanie McMahon could very well beckon her back into the ring one day. Either way, none of the twins' wrestling pursuits will see their way into Total Divas next season. "Nikki and I realized this year that you know what it was time to say goodbye to Total Divas and continue on with our spinoff, Total Bellas," Brie confirmed during the podcast. "We had to let one show go to keep our sanity," her sister chimed in, after explaining that working both series would have meant filming all year long. Brie really didn't want that for Birdie, anyway. Hear everything that went down during The Bellas Podcast's second episode now!